Kerala remembers the legend well. The man goes out to sea and the woman waits with her hands clenched in worry over her chest. But what happens when the roles are reversed? Although Rekha Karthikeyan had to find out the hard way, she has managed to become a living legend herself in the process. At the age of 47, Rekha has managed to become the first licensed fisherwoman in the country. On our first meeting, Rekha was busy weaving together a new fishing net with newly rented gear. She lives with her husband and four daughters in a small home that sits right next to the sea. 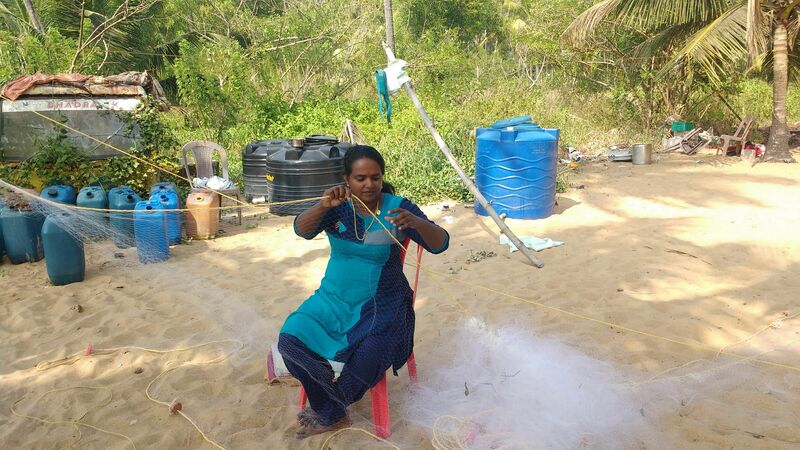 The salty sea air wafted past the backyard where Rekha and her husband, Karthikeyan KB, sat gently pulling at the net. "Sorry if I look tired," she says, "I was barely caught any sleep. We were at sea all night and got back at 3 AM. Then, we had to take the fish to the harbour, grab a registration letter from the post office and by the time we got back, we had to begin working on this net. Our old one got eaten by 'kadalpannis' (sea pigs)." 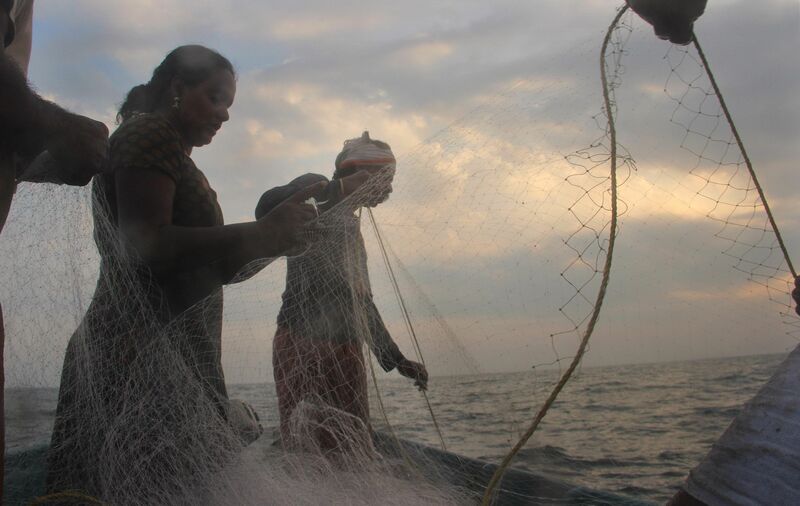 For Rekha and her family, profits depend on their catch of the day. 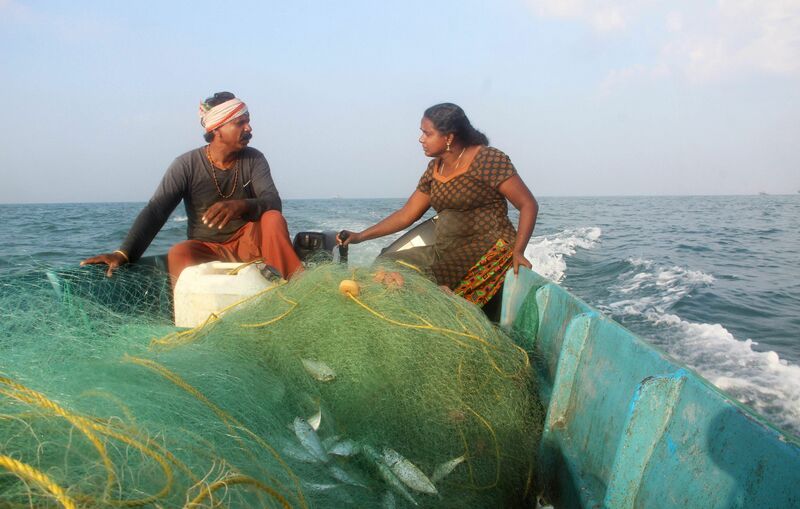 Their yield is measured in nets and Karthikeyan tells me, "On some days, we get 2,500 or 3,500 worth of a catch in our nets depending on the bucket fulls and on some days, we get nothing. Today was one of those bad days." For a long time, bad days were all that Rekha had known. 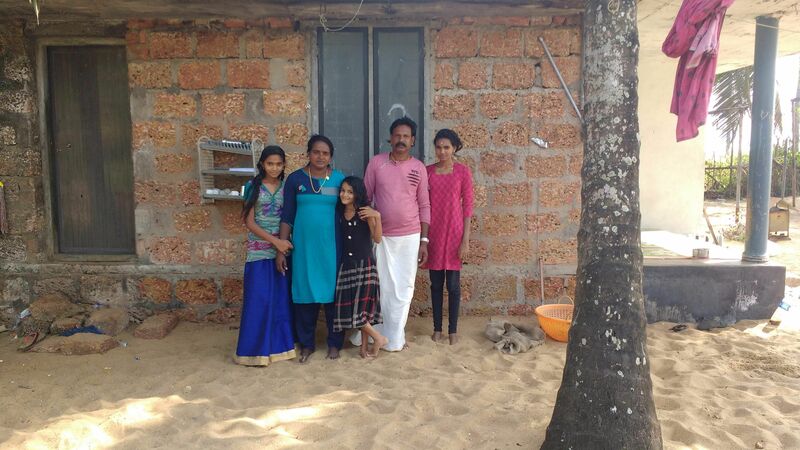 At 18, this young girl from Koorkenchery, Thrissur made the life-changing decision to elope with a man from the seashores of Chettuva. But in the process, she was abandoned by her family. "I come from an area that has no connection to the sea. It was only after moving here that I actually saw the water for the first time. I remember travelling in the sea for the first time on a cheruvanji (small boat). I learnt to weave the fishing nets together, I would help people with the preparation of the nets and taking it out to the water. It is a real talent to be able to actually catch a fish from the ocean without breaking the small holes in the net. We have to carefully remove the fish from within them. These are all basic small steps that I had to learn over time with each individual day." She goes on, "Once we bought a fibreglass boat of our own, I began sailing out to the sea. When I first went out, I was not even able to stand or hold steady. I used to sit and try to hold on to the net and help in any way possible. For two to three weeks, every journey out into the sea were just episodes where I would vomit so much that I had no energy left. It used to be so hard. I have even vomited blood once. And since my body wasn't used to the turbulence, I would come back home with intolerable back pain and soreness. It can get really harsh once you enter the deep seas. The thing is, the sea is unpredictable. Sometimes it is extremely calm, then it starts to get violent when you least expect it. It was one of the most gruelling experiences of my life but I went through it." And what kept her going? "I did it for our girls," she says, simply. "I don't consider myself special. I do this because I need to for my family to survive. Because ours was a love marriage, we never had any support from our families. It was just the two of us. We had to find a way to fight and survive. We owed at least this much for the children that we brought into this world. I had one firm belief. That the two of us together, if we toiled and worked hard enough, we would be able to make enough to support our children." In 2017, she was awarded a fishing license by the Central Marine Fisheries Research Institute (CMFRI). The license gives an individual a registered book that insures them against the dangers of the sea. "When we first asked for the license, they flatly denied it," says Rekha. "No woman has ever walked into their office and they did not even know what protocol to follow. They just told us that these weren't given to women and that women don't go out to the deep sea. They were actually scared to give it to us. What if something actually happened to one of us? In this job, we put ourselves in the gravest of danger and they didn't feel confident enough to trust that a woman could scrape out of that sort of situation unhurt." And what of the people around them? "We experienced pure ridicule," says Rekha. "For the longest time, we kept hearing people asking vile questions about a woman at sea. But we never paid any attention to any of it. None of these people are going to pay for our expenses or put food in our mouths. We have to take care of our own. We don't power through the harshest suns and the angriest storms to listen to their criticism and stop in our tracks." The tables have turned after Rekha's story started to get the attention that it deserved. "After they saw my face in the media, they started saying that it was because they spread the news about us. These days, they are of the habit of saying that we have lakhs bundled up in the bank. None of the media people, from the papers, the internet or the TV have been any help to us. They have spoken about us and moved on simply, each and every time. People think that we are earning money from this. The people we owe money to keep knocking at our doors because they think we are actually able to pay them." But beneath the smiling faces receiving plaques from superstars and making the headlines of the state's favourite dailies, piles of debt sit piled up. The government had gifted the family a small fish farm to raise. It was their only hope to pay off their debt. But during the floods that shook Kerala in 2017, the nets broke and their fish swam away. "We are always scared," says Rekha. "There is so much tension about our children, the debts and the future before we head into the sea. And once we are there, there is so much more danger surrounding us." But the family continues to stand tall. The tides keep washing in with a series of challenges but these six legends that be hold on for dear life. And just as young Rekha who pulled at the nets on her first days out at the sea, her whole body flailing with the wind, they grow stronger as a unit. As Rekha and Karthikeyan fold up their net in preparation for the sea, it felt like all that was in store for them were clear skies ahead.